Courtesy photo Avita Health System now has a cardio-oncology program to manage the risk of heart disease in cancer patients throughout every stage of their treatment. Cardio-oncologist Viren Patel, MD, has offices at 269 Portland Way South in Galion and 987 State Route 97 West in Bellville. GALION — Avita Health System now has a cardio-oncology program to manage the risk of heart disease in cancer patients throughout every stage of their treatment. Cardio-oncologist Viren Patel, MD, has offices at 269 Portland Way South in Galion and 987 State Route 97 West in Bellville. Cardio-oncology is an emerging field of medicine that focuses on the heart health of patients who have been diagnosed with cancer. It is offered to patients before, during, and after cancer treatment. Thanks to advancements in cancer therapies, the number of cancer survivors is increasing, yet some of the treatments and medications may cause lasting damage to the heart. Through Avita’s cardio-oncology program, patients can complete cancer treatment while protecting their heart function and ensuring better long-term cardiovascular health. A cardio-oncologist is a cardiologist with a special interest and expertise in preventing, detecting, and managing a patient’s risk of developing cardiovascular disease during and after cancer treatment. Cardio-oncologists understand the side effects of chemotherapy, targeted therapy, and radiation to treat cancer. They work closely with a patient’s oncologist to protect the patient from heart damage that cancer treatments may cause. Without specialized cardiac care, cancer therapies can lead to congestive heart failure, hypertension, arrhythmias, coronary artery disease, peripheral artery disease and pericarditis, among other heart conditions. Cardio-oncology ensures better cardiovascular outcomes for cancer patients, especially those who are risk for developing cardiac complications or experiencing cardiac symptoms and those who may have heart damage as a result of cancer therapy. For more information on services available at Avita Health System, visit www.avitahealth.org. 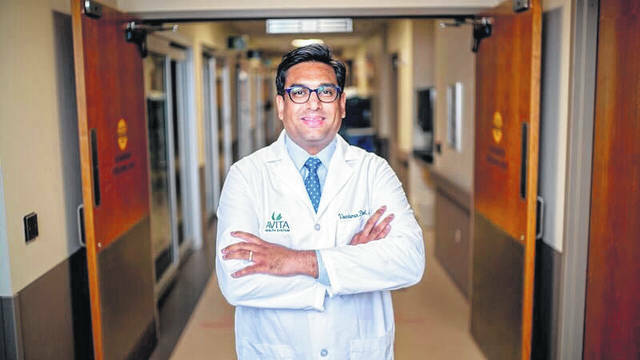 https://www.galioninquirer.com/wp-content/uploads/sites/38/2018/10/web1_Dr.-Viren-Patel.jpgCourtesy photo Avita Health System now has a cardio-oncology program to manage the risk of heart disease in cancer patients throughout every stage of their treatment. Cardio-oncologist Viren Patel, MD, has offices at 269 Portland Way South in Galion and 987 State Route 97 West in Bellville.